February’s dark skies will provide some prime stargazing opportunities for the public at the University of Wyoming Harry C. Vaughan Planetarium this month. 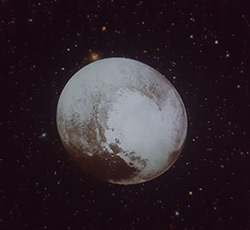 Additionally, the planetarium will have its usual variety of shows, which this month include programs on Pluto, the Milky Way, black holes and alien life. Friday planetarium shows during February start at 7 p.m., with a STAR Observatory tour scheduled to follow approximately an hour later. Kid-themed shows are scheduled Saturdays at 11 a.m. The month also includes four Tuesday night shows; they begin at 7 p.m.
-- “Stellar Afterlife,” Friday, Feb. 2, 7 p.m. Our star, the sun, plays an essential role in our lives, but also to the solar system’s structure. Eventually, our star will end. But, with ends, are new beginnings. Journey through time in life after the death of our sun and many other stars. A free STAR Observatory tour (weather dependent) follows at 8 p.m.
-- “Astronauts, Spaceships and Robots!” Saturday, Feb. 3, 11 a.m. Did you know that we have sent robots to land on Venus? Or, that we have a probe that is outside of our solar system? Humans have explored far into the exciting frontier of outer space. In this program, visitors will learn all about the places we've explored with astronauts in spaceships and robots flying on giant rockets. The program will even take a look at future missions to space and figure out where visitors might want to explore one day. Visitors can stay after the show to build their very own spaceships to decide where in the universe they want to go. -- “Distant Worlds – Alien Life?” Tuesday, Feb. 6, 7 p.m. When we look up at the night sky, we are looking out into the universe. Does alien life exist? In this program, visitors will journey outward to see what it takes for life to develop -- starting with life on Earth and moving out to the rest of our solar system and on to alien planets that orbit distant stars in our galaxy. What might be essential for alien life on distant moons or planets, and how could we detect it? -- “Discovering the Cosmos,” Friday, Feb. 9, 7 p.m. In the past few hundred years, our understanding of the solar system changed drastically from a geocentric to heliocentric model, and then grew exponentially with the discovery of Uranus, Neptune and Pluto. The Hubble space telescope has seen many other galaxies in our universe and observed how the universe is expanding. Astronomers understand much more about the universe now than we did even a few years ago. But, we don’t know everything yet; dark matter, dark energy and black holes are still mysteries waiting to be uncovered. This program will explore discoveries astronomers have made and how they changed everything we thought we knew about space. As visitors learn more about the universe, will their understanding change all over again? A free STAR Observatory tour (weather dependent) follows at 8 p.m.
-- “Wyoming Stargazing,” Tuesday, Feb. 13, 7 p.m. As the months and seasons change here in Wyoming, new astronomical events occur in our nighttime sky. No matter what time of year, there is always something to see after the sun goes down. From constellations to meteor showers to visible planets, this program acts as your guide to these remarkable events and where to find them. -- “Pluto Reclassified,” Friday, Feb. 16, 7 p.m. From its discovery in 1930 to reclassification in 2006, Pluto has been a hot topic here in the USA and a favorite among schoolchildren. But, a common misunderstanding is that Pluto somehow disappeared from our solar system in 2006. While not a planet, Pluto is still in orbit around our sun. This program will remember Pluto: its brief period as a planet; reasons for its reclassification; New Horizons discoveries; and America’s reaction to it all. A free STAR Observatory tour (weather dependent) follows at 8 p.m.
-- “Distant Worlds – Alien Life?” Tuesday, Feb. 20, 7 p.m. When we look up at the night sky, we are looking out into the universe. Does alien life exist? In this program, visitors will journey outward to see what it takes for life to develop -- starting with life on Earth and moving out to the rest of our solar system and on to alien planets that orbit distant stars in our galaxy. What might be essential for alien life on distant moons or planets, and how could we detect it? -- “Black Holes, Supernovae and The Wacky Stellar Graveyard,” Friday, Feb. 23, 7 p.m. Carl Sagan famously explained that we are made of stardust. But, what exactly does that mean? Visitors will learn more about interstellar dust, nuclear fusion, the origins of the periodic table and how they all lead to cataclysmic deaths of stars. A free STAR Observatory tour (weather dependent) follows at 8 p.m.
-- “Wyoming Stargazing,” Tuesday, Feb. 27, 7 p.m. As the months and seasons change here in Wyoming, new astronomical events occur in our nighttime sky. No matter what time of year, there is always something to see after the sun goes down. From constellations to meteor showers to visible planets, this program acts as your guide to these remarkable events and where to find them.